The Tea Party is a Canadian musical group formed in Windsor, Ontario. 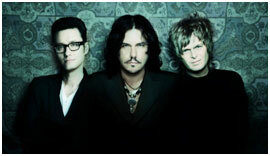 The band consists of Jeff Martin (born October 2, 1969 in Windsor, Ontario), Stuart Chatwood (born October 22, 1969 in Fleetwood, Lancashire, England), and Jeff Burrows (born August 19, 1968 in Windsor, Ontario). The band is known for its unique sound, which blends classic rock with influences from many countries around the world. Martin, Chatwood, and Burrows, who were high school classmates and grew up in Windsor, formed the band in 1990. The band’s debut album, Tea Party, was released independently in 1991. The band’s subsequent records, including Splendor Solis (1993), The Edges of Twilight (1995), Triptych (1999), and Seven Circles (2004), were all released by EMI Music. The band’s 1997 album entitled Transmission was produced by the label Atlantic. Splendor Solis sold upwards of one million copies in Canada. Many of their albums have been nominated for Juno Awards, including Splendor Solis, The Edges of Twilight, and Interzone Mantras (2001). Though they disbanded in 2005 as Martin prepared to pursue a solo career, the band released several live records between 2006 and 2008. The band also released The Ocean at the End in 2014. The Tea Party’s sound is often likened to artists such as Led Zeppelin and The Doors, and Martin’s vocals have been compared to those of The Doors’ lead singer Jim Morrison. The band is also well known for its blend of hard rock and Middle Eastern, Celtic, and Mediterranean sounds. Having grown up in Windsor and, therefore, near Detroit, Martin has also cited Motown and Blues as musical influences. Lamb, K. (2001). The tea party. Canadian Musician, 23(5), 34. Monk, K. (1996). Tea party steeped in chaos theory: Singer Jeff Martin says the tea party now has a sound to call its own after suffering comparisons to yesterday’s bands. The Vancouver Sun. Retrieved from the Vancouver Sun. Muretich, J. (1999, May 27). The tea party gets personal with latest CD. Calgary Herald. Retrieved from the Calgary Herald. Zivitz, J. (2001, Oct 16). Tea party heavy again on interzone mantras; Windsor band releases fifth full-length studio album. The Windsor Star. Retrieved from the Windsor Star. Zivitz, J. (2001, Oct 11). Tea party comes out swinging: Canadian crew out to prove it’s “one of the heaviest rock bands going” with interzone mantras. The Gazette. Retrieved from The Gazette. Tea Party. (1991). The Tea Party. Canada: Eternal Discs. Tea Party. (1993). Splendor Solis. Canada: Eternal Discs. Tea Party. (1995). The Edges of Twilight. Canada: EMI Music Canada. Tea Party. (1999). Triptych. Mississauga, Ontario: EMI Music Canada. Tea Party. (2004). Seven Circles. Canada: EMI Music Canada.